Energy sector could be the new bridge to the relationship between India and Russia—two countries which have decided to complete the construction and commissioning of at least 12 nuclear units in next two decades. The decision was taken during talks between Prime Minister Narendra Modi and Russian President Vladimir V Putin, in New Delhi. On Thursday, the very first of day of Russian Federation’s president’s visit, heads of both the countries—signed a Memorandum of Understanding and presented a strategic vision for strengthening cooperation in peaceful uses of atomic energy. In the 15th annual summit between the two countries, both the leaders agreed to expand manifold bilateral cooperation in the field of energy, including oil and gas, electric power production, nuclear energy, renewable energy sources, and energy efficiency. The leaders envisage broader collaboration between hydrocarbon companies of the two countries in oil and gas exploration and production as well as in Liquefied natural gas projects and supplies. The sides will promote natural gas utilisation as an abundant and environmentally friendly source of energy for diverse purposes in their economies, including motor fuel and feedstock. The countries will study the possibilities of building a hydrocarbon pipeline system, connecting the Russian Federation with India. They will also examine avenues for participation in petrochemical projects in each other's country and in third countries. India and Russia will expand their cooperation in science and technology, industry, localisation of equipment and spares, uranium mining, fabrication and supply of nuclear fuel, management of spent fuel and in other aspects of the nuclear fuel cycle. Towards this objective, the India has agreed to expeditiously identify a second site, in addition to Kudankulam, for the construction of the Russian-designed nuclear power units in India. Prime Minister Narendra Modi said that he is pleased that the first unit of the Kudankulam Nuclear Power Plant is on stream. 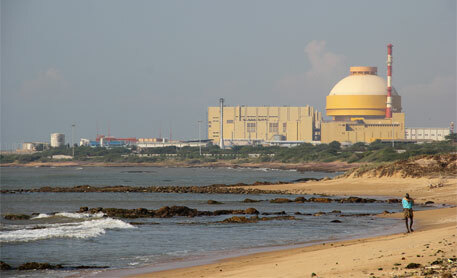 It has added 20 percent to the existing capacity for nuclear power in India. “We are on course for installing the next three units of 1000 MW each. Today, we have outlined an ambitious vision for nuclear energy of at least ten more reactors. It will have the highest standards of safety in the world. It will also include manufacture of equipment and components in India. This also supports our Make in India policy,” he added. Highlighting the strategic vision for strengthening the peaceful uses of atomic energy of India and Russia, both sides expressed satisfaction over the progress towards putting into commercial operation Unit-1 of the Kudankulam Nuclear Power Plant (KKNPP), which achieved full rated power in July 2014. They also agreed to take necessary steps to expedite commissioning of Unit-2 of the KKNPP. The sides welcomed the entry into force of the General Framework Agreement (GFA) of April 10, 2014 for KKNPP Units 3 and 4. Russia will provide equipment with long manufacturing cycle and first priority equipment for implementation of projects for KKNPP Units 3 and 4. Both the countries have decided to complete the construction and commissioning of at least 12 units in next two decades. The sides will develop a framework for collaboration in the field of radioactive waste management as well. For this, Indian side has agreed to expeditiously identify a second site, in addition to Kudankulam, for the construction of the Russian-designed nuclear power units in India. The countries are looking forward for localisation of manufacturing of equipment and fuel assemblies in India as the goal of their future collaboration. Acknowledging the importance of maintenance of nuclear power plants for uninterrupted operation, both sides will put maximum efforts into development of the cooperation in such directions as nuclear power plants technical maintenance and repair, modernisation and retraining of personnel. Of late there is much interest in Solar PV in India especially large PV Projects in Rajasthan.There is great scope to go in for more offshore and onshore Wind Projects.I am glad that Nuclear power expansion in India with Russian collaboration in the pipeline. Nuclear energy has also a role to play in the Energy Mix.